'Top Gear' Team Signs Deal With Amazon; New Car Show Set For 2016 : The Two-Way The trio left the BBC under a cloud after Jeremy Clarkson's contract was not renewed because of a physical and verbal attack on a show producer. 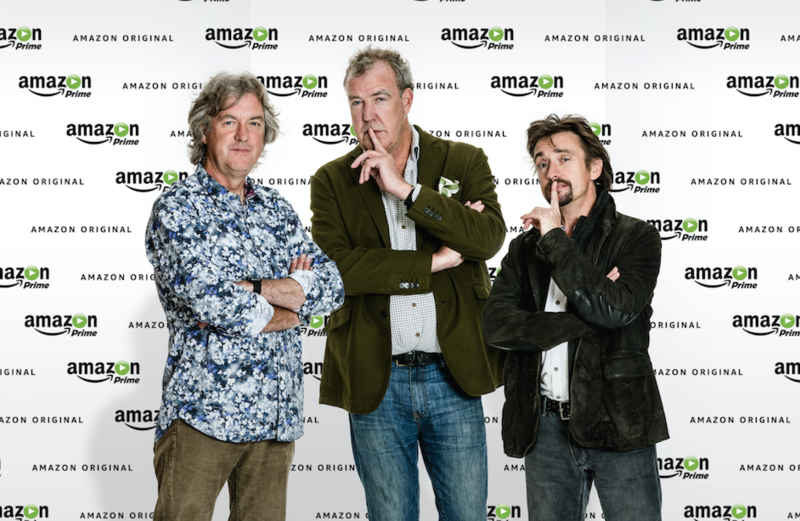 James May, Jeremy Clarkson and Richard Hammond have signed a deal for a new show with Amazon. Months after they left the BBC, car enthusiasts Jeremy Clarkson, Richard Hammond and James May are headed to Amazon, hoping to re-create the success of the long-running TV show Top Gear. The trio left the BBC under a cloud after Clarkson's contract was not renewed because of a physical attack on a show producer. "The show will be produced by the trio's long time executive producer Andy Wilman," Amazon announced Thursday, adding that production on the new show, whose name wasn't revealed, will begin soon. The move is another step in the retailer's attempts to win viewers in the growing area of streaming video. It also allows Clarkson, May and Hammond to produce a new show without running afoul of a requirement in their old contracts that would keep them from making a U.K.-based show for the next two years, the BBC notes. In a statement issued by Amazon, Clarkson said, "I feel like I've climbed out of a bi-plane and into a spaceship." When Clarkson left the show in March, his two co-hosts soon followed suit. Their new deal with Amazon is reportedly for three seasons. Top Gear is currently being retooled by the BBC for a new launch; it's "the most watched factual program of all time, with an estimated worldwide audience of some 350 million," The Verge reports. As the show's leading host, the provocative Clarkson has often come under fire for comments that were called callous or offensive. In 2011, he said public workers who staged a large strike should be shot "in front of their families." On another show, he suggested that truck drivers regularly murder prostitutes. But Clarkson was cast out of one of the BBC's flagship productions in March, after he carried out what the network called an "unprovoked physical and verbal attack" on a producer, who became the target of expletives, threats of firing and an apparent blow to the mouth, the BBC said. Clarkson's contract was not renewed in March — a decision that drew the support of British Prime Minister David Cameron. But Clarkson hasn't been the only problematically bombastic presence on the show. In 2011, Richard Hammond angered many when he said that a car produced in Mexico should resemble "a lazy, feckless, flatulent, overweight ogre leaning against a fence, asleep, looking at a cactus with a blanket with a hole in the middle as a coat." After the BBC's leadership decided to part ways with Clarkson, Hammond said, "We're all three of us idiots in our different ways but it's been an incredible ride together."